Story: "At dinner one night, my mom made salmon cakes with leftover salmon. They were crispy and yummy. After I met with a worker from my town's farm and learned all about New Jersey's state fruits and vegetables, I decided to make my own recipe, but with healthier foods. Many of the fruits and vegetables in my recipe are from my state, and some were even from my own garden. I substituted frying the cakes with baking as a healthier choice. The pickle sauce is like my mom's tartar sauce but healthier with yogurt. It tastes great now with all the healthy changes and I love it even more!" Gianna always serves this with a fresh green salad. --In a large bowl, whisk together all of the ingredients and add the salmon last. Marinate up to 1 hour in the refrigerator. --Preheat the oven to 400 degrees. --In a nonstick skillet over medium heat, cook salmon with 1/4 cup of marinade, about 6 minutes per side or until both sides are slightly opaque. --On a large nonstick baking sheet, or one lined with parchment or greased with oil or nonstick cooking spray, pull apart cooled salmon using 2 forks. --Add in all ingredients and mix with your hands, forming 4 cakes. --Bake about 10 minutes, or until golden brown on the bottom, and then carefully flip to cook the other side, about 10 minutes. --In a medium mixing bowl, combine all the ingredients. 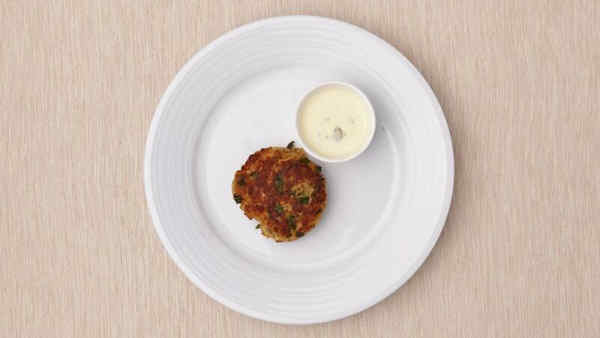 --Top cooked Salmon Cakes with 2 teaspoons Pickle Sauce and serve with salad.